Try this favorite pie recipe from the 60s. 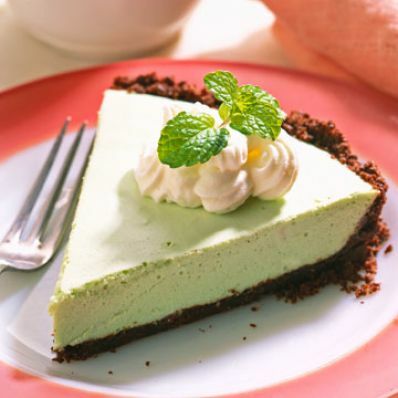 Named for the creamy drink made with creme de menthe liqueur, it's similar to a chiffon pie filling. 1 of 1 In saucepan, combine mint leaves and sugar; slightly crush mint with spoon. Add 1 cup water and cloves. Bring to a boil; simmer 10 minutes. Let syrup stand, covered, overnight. Strain. 1 of 3 In processor, pulse cookies until crushed. Add butter; process until crumbed. Press over bottom and up sides of 9-inch pie plate; refrigerate. Beat cream until stiff; refrigerate. 2 of 3 In saucepan, sprinkle gelatin over 3/4 cup syrup; let stand 5 minutes. Over medium-low heat, stir to melt gelatin. Whisk in yolks; cook, stirring, until thickened, 4 minutes (160 degrees F). Stir in chocolate until melted. Remove from heat; stir in liqueur. 3 of 3 Pour into bowl. Place over larger bowl with ice water. Stir until consistency of raw egg whites, 5 minutes. Fold in whipped cream. Pour into crust. Refrigerate at least 4 hours. Per Serving: 112 mg sodium, 1 g fiber, 11 g sat. fat, 92 mg chol., 20 g Fat, total, 39 g carb., 4 g pro., 353 kcal cal.